For developers that are using Scrum methodology, it is not important to stress importance of unit tests when developing a new piece of code. There are also some limitations of Unit Tests. As per definition, Unit Tests are the smallest testable part of code. For that reason unit testing won’t catch every error in a program. It refers to system wide errors like Integration or database errors, or errors that depends of multiple classes etc. Performance issues won’t be captures as well. Unit tests are very often not realistic, as scope of testing is too narrow. It’s difficult to create Unit Test if even the smallest unit of code under testing has external dependency. Despite of all limitations, Unit Testing is indispensable part of modern software development. Unfortunately, you may still find a places where developers are skipping unit testing in praxis. SQL Developer is well equipped with all necessary tools to start using unit tests. In this blog you can find instructions how to setup Unit Test Repository, and how to setup users and prepare environment for performing unit tests. How to actually perform Unit Test will be described in one of the following blogs. There are several phases of Unit Tests. Purpose of start up actions is to make a backup of a table or to insert test data. By leveraging start up actions I can easily overcome one of the limits of Unit Testing, and create more realistic user cases for testing. In this phase I can call procedure/function with parameters and specify whether it is expected successful call or exception. This is the only mandatory step. In validation phase you can validate results from the previous phase. 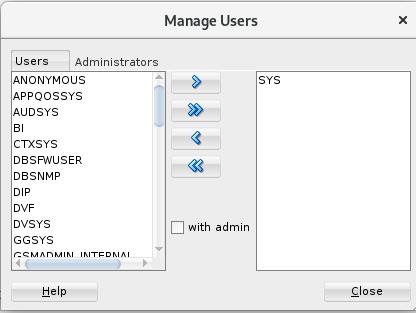 to delete the rows inserted in the start up action step. After short introduction, let’s start to do actual work. First you need to install and configure test repository which holds the necessary objects (tables, views, code + unit testing data) needed to perform unit testing. Shared repository allows you to share the test cases, test suites and test library among the team members. On the opposite side, unshared repository, as it’s name imply, cannot be shared among multiple users/schema. It’s private repository for only one user/schema. Although you can define multiple private repositories (e.g. one private repository for each developer user/schema), you can have only one shared repository in database. Here are the steps needed to create shared repository. Click on Yes and the new message will pop up. Finally the Unit Test repository will be created, which can be confirmed by the last message. On the Unit Test box within SQL Developer you’ll get necessary controls to work with tests. 3. Convert created repository into shared type so that all developers can use it. 4. Create user/schema for performing unit tests. Here I’m going to clone SCOTT schema to play with unit tests. As I marked unit_test_repo as shared, I want to add users who can perform the unit tests. For that reason I’ve created unit_test_scott user in the previous step. 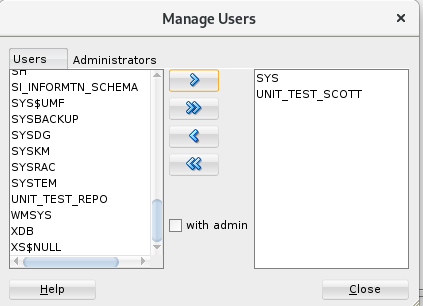 This is how I can add unit_test_scott user to be able to use created repository. Users can use the repository to perform Unit Tests, while Administrators can add/remove users and manage repository. I need to add UNIT_TEST_SCOTT in the repository Users list, by selecting user I want to add and click on the right arrow. Final result you can see on the next figure. On the last figure you can see the content of the Administrators tab. At this point you should have everything ready to start playing with unit tests.